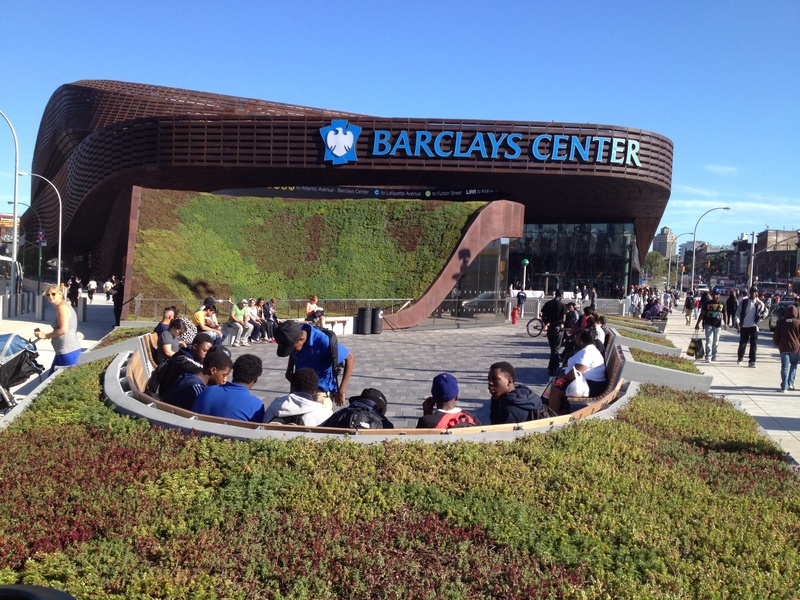 Barclays Center Plaza at Atlantic Yards is located at 620 Atlantic Avenue, Brooklyn, NY 11217; visit their website. Read the December, 2012 Barclays Center, SHoP Architects: Beauty and the Behemoth by Joann Gonchar in Architectural Record; the November 28, 2012 15-building Atlantic Yards project to be pre-fabricated construction technology worth nearly $5 billion” by Jason Sheftell in NYDailyNews.com; and the September 28, 2010 Renderings Of Plaza Planned For Atlantic Yards Barclays Center by John Del Signore in gothamist. 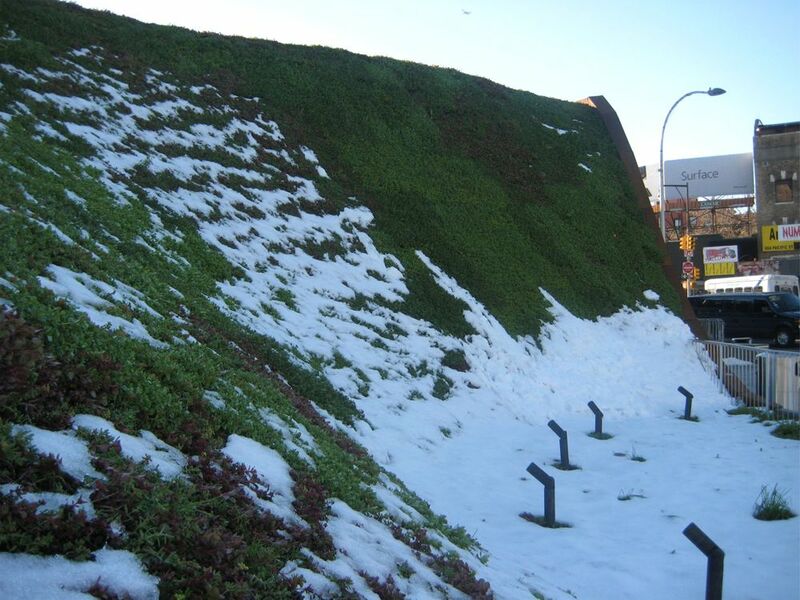 Learn more about American Hydrotech in The Greenroof & Greenwall Directory. “The building is the first piece of the controversial $4.9 billion plan by Forest City Ratner Companies (FCRC) to redevelop Atlantic Yards-22 acres that straddle 11 subway lines and a commuter railroad. The development, which has been long delayed by community opposition and the recession, calls for a 16-tower, mixed-use complex, including 6 million square feet of residential space,” (Architectural Record, 2012). American Hydrotech technology successfully helped bring the architects’ plans to life, transforming the subway transit entrance into an innovative and visually-appealing green space for residents and patrons of the center to enjoy. 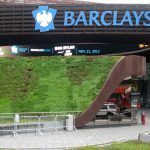 The project features custom InstaGreen Sedum Tile vegetation installed over Hydrotech’s GardNet technology to accommodate the steep slope of the dramatically-shaped transit entrance tunneled roof. The slope of the project varies from at grade to 51 degrees at the steepest section. 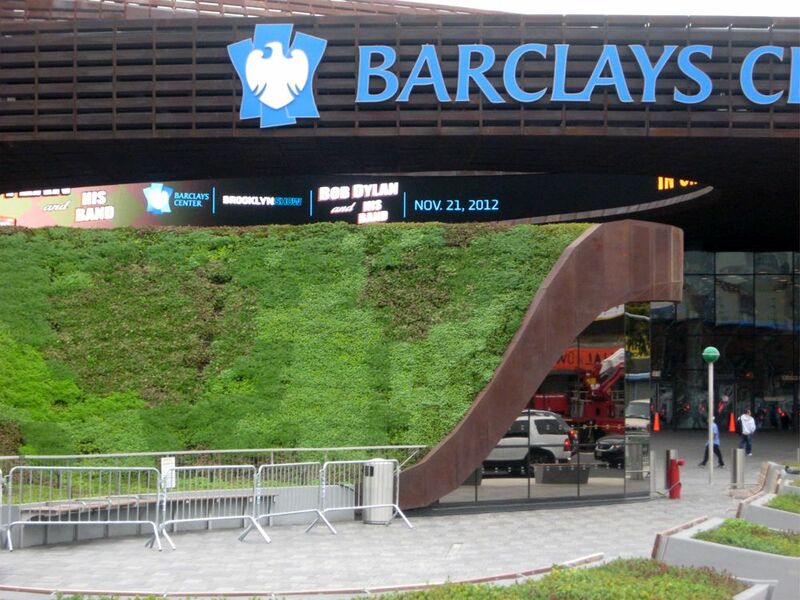 In addition to the roof of the transit entrance, two-semi rings of planters that wrap around the entrance are also planted with Sedum. 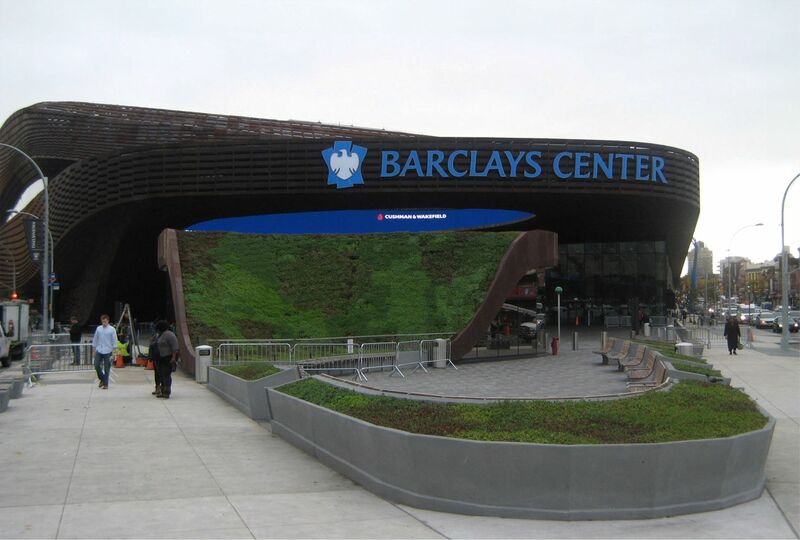 The Barclays Center opened its doors to hip hop mogul Jay-Z as its first entertainment act on September 28, 2012. 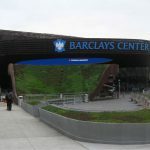 The arena is currently home of the National Basketball Association’s Brooklyn Nets and will host a number of other entertainment and events throughout the year. Utilizing pre-fabricated construction technology, the 15-building Atlantic Yards project is estimated to be worth nearly $5 billion when completed by summer, 2014. 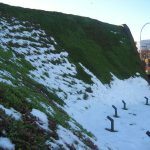 Greenroof System: American Hydrotech, Inc.